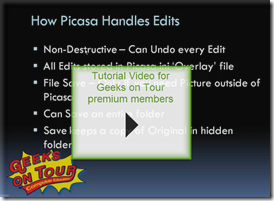 Original vs Edited Photo in Picasa – Learn Picasa and Google Photos! I am trying to find “how to posterize” a photograph. I have seen it in photoshop but don’t want to purchase a whole programme. I would also like to hear snot putting photos on a flash drive versus a CD. Posterize is an option on the fourth tab of editing tools in Picasa. As for putting photos on a flash drive, Picasa can do that with the Export command. Thanks, thank, thanks – I have learnt so much more than I expected to. I appreciate you all taking the time to answer our questions. Picasa: 2015 Year in Review–Good News/Bad News Picasa is Dead. Long Live Picasa!